I have some new tools in the tool box for the 2010 Season. This calendar will show what dates you are available. Take the booking info from your customer, Runs their CC for the deposit, and show the date booked on the Calendar. Comes with a Complete Admin interface that is real easy to use. If I host your site....$200 to install it. No yearly fees. Your fishing reports get stale quick. Keep your customers (and your fishing reports) up to date with out having to deal with the webmaster. I will install this great application and skin it to look just like the rest of your site. Log in with a Username and password. Type your fishing report, Upload your photos and away it goes. Tired of waiting for your Web Master to update your Photos? We will install Gallery1 or Gallery 2 and Skin it to look just like the rest of your site. Upload your own photos. We offer the best services on the North Carolina Coast bar none. Complete turn key website including your first year of hosting and domain name. We guarantee your Top 10 Search Engine Results for your choice of keywords. Features include Photo Galleries, User Updatable Fishing Reports and Book Your Boat booking calendar. 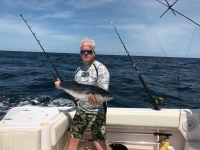 Hit Google for North Carolina Charter Boats or Morehead City Charter Boats or Carolina Beach Charter Boats or Holden Beach Charter Boats and see what you get. Sites Built by FryingPanTower.Com do excellent with the search engines. Why spend your money with some Mega company? Have you ever tried to call tech support? Good Luck! Host your site right here at FryingPanTower.Com. We offer FULL service hosting complete with Plesk Control Panels, Full E-Mail access, Backup Scripts and lots more. Mega companies put 1000's of site on a single server. You have limited access to tools. Limited CPU usage, Limited Databases. We only allow 100 sites per server. Plenty of space, CPU and Memory to go around. Did I mention Tech Support? No one in India or China here. You call tech support.....You are talking to me. Tired of be buried at the bottom of the search engines? We will work your site over Top to Bottom to get you the best Search Engine results possible. Hit Google for North Carolina Charter Boats or Morehead City Charter Boats or Carolina Beach Charter Boats or Holden Beach Charter Boats and see what you get. Sites Optimized by FryingPanTower.Com do real well. We will work on just about anything web related. Just give us a call and we are happy to quote you a price. If there is anything I can do to help just give me a call. Dave is the man I must say I am not the smartest computer person in the world but using the software & makijng the updates is a breeze. But in case of the rare chance I do have problems I have him on speed dial & it is always an easy task. (99% of the time it is my own stupidity) Thanks Dave you the man! We still need some more photos for this one....so the slide show works right....but overall it is done. Many thanks to you Dave for all you have done to create my website. Working with you was very easy and pleasant, and the job was done very timely. I appreciate your attention to detail, and your great ideas on creating a great site!! Everyone that has seen it says it looks great and is very easy to navigate and that is exactly what I wanted. I also appreciate your willingness to help with the business cards and magnets. Your professionalism is second to none. I will definitely recommend you to any of my friends who need a website. Have a blessed Christmas season and Happy New Year!! For any of you folks that need or think you need a website, I totally recommend Dave for the job. I know this sounds like a commercial but when someone does a good job, I think everyone should know! He took a handfull of photos, some verbage from me, a few links to some edited video to you tube and BAM !!! You can "shop til you drop" for price, service and quality... there is no better bang for your buck than dave in regards to building a website that is effective and "ready to do business". I don't know why but I really like the pictures of the types of fish with the names on the length of each charter available. Just want you to know that I am very, very, very pleased with my website and the hits that I get on the search requests---- you are indeed the man,----Capt. Chip Berry, Maps Unique, Inc.
Top 10 across the boards for â€œCustom AR-15s â€� as promised. #1 across the boards for "Morehead City Fishing Charters"
Not too bad for a month OLD site....LOL!